Anthony F Jahn,	The Journal of Laryngology & Otology, Volume 127 Issue 2, pp 111-113. E Sivayoham, R Saunders, B Derby, T Woolford,	The Journal of Laryngology & Otology, Volume 127 Issue 2, pp 114-120. K Hörmann, H Sadick,	The Journal of Laryngology & Otology, Volume 127 Issue 2, pp 121-127. M E Smith, F Riffat, P Jani,	The Journal of Laryngology & Otology, Volume 127 Issue 2, pp 128-133. J F Polanski, O L Cruz,	The Journal of Laryngology & Otology, Volume 127 Issue 2, pp 134-141. 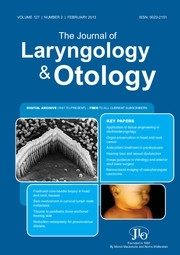 S Bakır, N Penbegül, R Gün, E Yorgancilar, V Kiniş, M Özbay, M Atar, M Güneş,	The Journal of Laryngology & Otology, Volume 127 Issue 2, pp 142-147. E Sozen, S B Erol, O Yildirim, B U Coskun, T Basak, F T Kayhan, B Dadas,	The Journal of Laryngology & Otology, Volume 127 Issue 2, pp 148-152. S Erbek, H Erinanc, E Hizal, L N Ozluoglu,	The Journal of Laryngology & Otology, Volume 127 Issue 2, pp 153-158. V Visvanathan, G W McGarry,	The Journal of Laryngology & Otology, Volume 127 Issue 2, pp 159-162. J F Thong, D Loke, R Karumathil Sivasankarannair, P Mok,	The Journal of Laryngology & Otology, Volume 127 Issue 2, pp 163-169. R P S Punia, R Aulakh, S Garg, R Chopra, H Mohan, A Dalal,	The Journal of Laryngology & Otology, Volume 127 Issue 2, pp 170-174. D J Bowyer, I Smillie, I Ganly,	The Journal of Laryngology & Otology, Volume 127 Issue 2, pp 175-180. A D Dragan, I J Nixon, A A Orabi, A Manganaris, J-P Jeannon, M T Guerrero-Urbano, R Simo,	The Journal of Laryngology & Otology, Volume 127 Issue 2, pp 181-186. P Lennon, J Saunders, J E Fenton,	The Journal of Laryngology & Otology, Volume 127 Issue 2, pp 187-191. Y Tamura, M Suzuki, M Yamamoto, T Yoshida,	The Journal of Laryngology & Otology, Volume 127 Issue 2, pp 192-195. L-S Tseng, S-D Luo,	The Journal of Laryngology & Otology, Volume 127 Issue 2, pp 196-199. E Shamil, V Topsakal, W Grolman,	The Journal of Laryngology & Otology, Volume 127 Issue 2, pp 200-202. W F Mourad, K S Hu, R A Shourbaji, L B Harrison,	The Journal of Laryngology & Otology, Volume 127 Issue 2, pp 203-206. S M Hyun, J-Y Min, Y J Jang,	The Journal of Laryngology & Otology, Volume 127 Issue 2, pp 207-210. Z Sun, L Sun, Y Gao, X Ma,	The Journal of Laryngology & Otology, Volume 127 Issue 2, pp 211-214. P K Shenoy, M Aldea,	The Journal of Laryngology & Otology, Volume 127 Issue 2, pp 215-216. I Aladag, A Eyibilen, M Güven, O Atis, Ü Erkorkmaz,	The Journal of Laryngology & Otology, Volume 127 Issue 2, p 217.